Tanmoy is a lead in the operations improvement practice at Dastur. He has handled operations in steelmaking (EAF and Converter based), productivity improvement, raw materials and asset optimization, and techno-economic appraisal of projects at some of the largest steel plants in India, Middle East, and in the USA. Apart from working in process engineering and projects, he has successfully led operations in carbon and special alloy steels. Tanmoy enjoys a well-deserved reputation as a tireless customer advocate, for not resting until all resources that can help solve a customer's problem have been used on the customer's behalf. Prior to Dastur, Tanmoy worked as an Operations Manager in Jindal Steel and was actively involved in projects with firms such as Boston Consulting Group, Lhoist, Bio Steel. 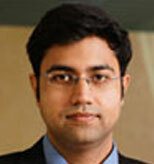 He is a Lean Six Sigma Green Belt and an active member of the AIST and The Indian Institute of Metals. He has successfully completed training from SMS Germany. Tanmoy completed his B.Tech in Metallurgy & Materials Engineering.